This 3rd-party game, created by Zukor Interactive, is an excellent biofeedback and neurofeedback training tool for clinicians that are looking for a superior feedback experience with their clients. Training children and adults becomes significantly easier as they watch their skateboarding character travel through the Zukor world, pulling tricks, getting points and activating special events. A variety of settings and special effects can be set by the clinician, to maximize or minimize the intensity of feedback. 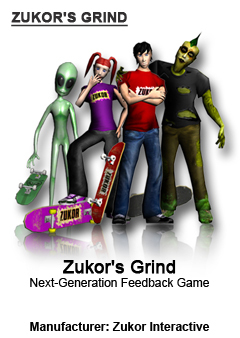 Zukor's Grind is available in English, Spanish, German, Polish. French is also coming soon. (Please note that the software download is in English, however the system will ask what language you wish to use). Upon purchase, a document is presented that explains the download process for Zukor's Grind.